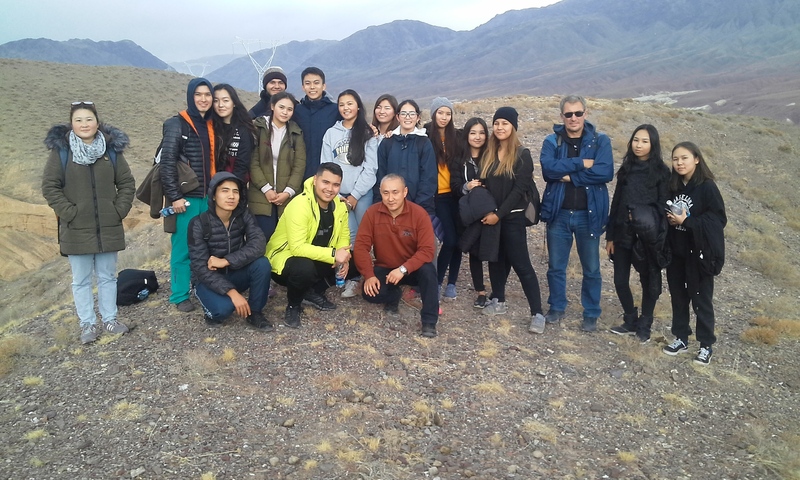 American University of Central Asia - AUCA - A tour for AUCA students: "The amazing landscapes of Konorchek canyons resemble the Grand Canyon in USA"
On Monday, 6 November 2017, department of EMSD and Applied Geology have organized a tour for AUCA students to the “Konorchek” canyon. The amazing landscapes of Konorchek canyons resemble the Grand Canyon in the USA, but at the same time they carry a significant particle of the unique nature of Kyrgyzstan. It's a fabulous place located in 125 km from Bishkek, in Boom gorge. Konorchek canyon is a mysterious land of intensely coloured and textured formations of red sandstone. It's a wild and inspiring region. A special attention was paid to extinct volcano, age of which is estimated as 2.5-3 million years. The climate in the canyons of Konorchek is quite unusual and original. During the summer time it is very hot and dry; winters are cold, but rather snowless. The aim of this tour was to study of mountain landscapes. “We visited the place, where many years ago Issyk-Kul Lake was existing. Because of Mountains Formation, canyons appeared. Professors told us about ecosystem of this place: about importance of plants and about different kinds of animals that are living there. We have recognized many interesting things about such a beautiful place”, Aidana Ermatova (ECO-117). “Canyon Konorchek resemble Fairytale canyon. It was feeling like the beautiful place was hidden from human's eyes because it took us to go quite a long way to get there. The view was astonishing, and ultimate red rocks were very impressive. We saw salt and it was interesting because Professor explained us that we were standing on the ex-bottom of ancient Issyk-Kul. The weather was absolutely nostalgic that made the history of that place even more exciting. I liked this trip a lot”, Kunduz Kurmanbaeva (GEO-116).